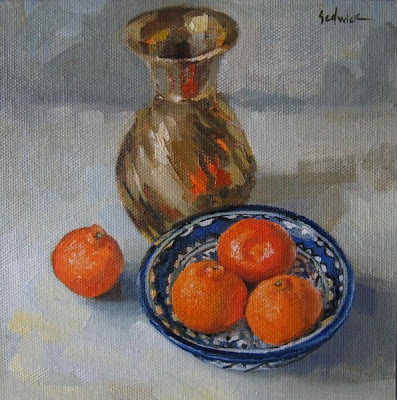 I painted these oranges very slowly and carefully, with a small brush. 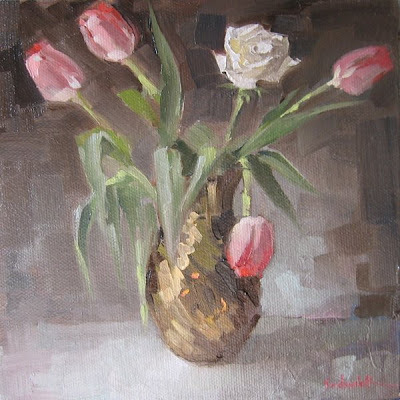 By contrast, I painted the brass vase loosely, with a larger brush. I loved putting the splashes of orange in the reflective surface of the vase. 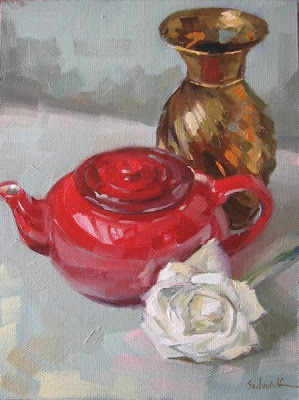 On bright, sunny days it's not only easier to take better quality photos of paintings, it's easier to create paintings full of vibrant color. It's been quite a while since I've had anything to post - but it hasn't been for lack of trying! Life has thrown several wonderful distractions in my path in the last month, and to say the least, my focus has been elsewhere. Jesse and I found out that we are expecting our first baby in August - and we are also in the process of buying (and renovating) our first house! Many thanks to those of you who have emailed to ask if everything is OK - everything is perfectly fine - but my posts may be a bit sporadic in the coming weeks as I continue to deal with all the tiredness and other fabulous physical symptoms of early pregnancy. I'm really looking forward to moving into my new, much larger studio, and doing lots of painting in the coming year.